OUR PRICE: $78.20 - Join Rewards Get $7 Dance Dollars On This Item! Introducing the new and improved CG09 from Capezio. 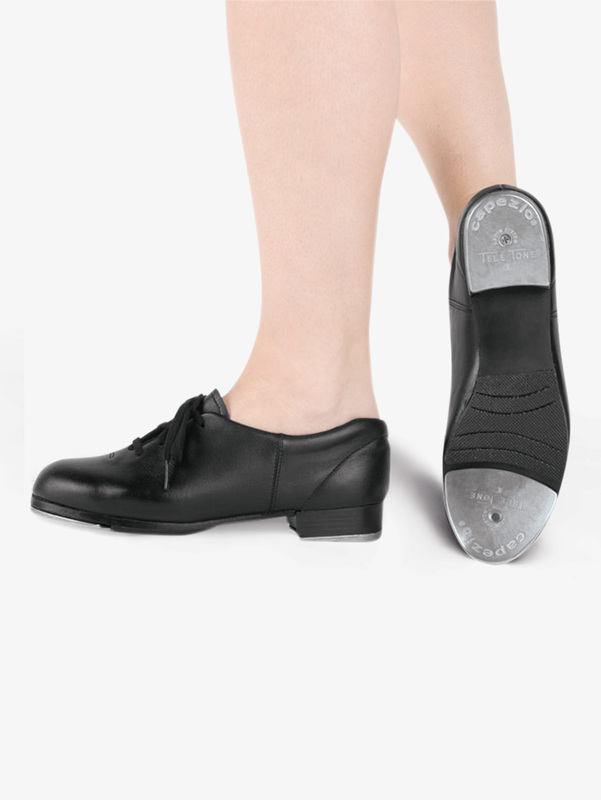 They have just made their most popular tap shoe better than ever. Featuring a full grain leather upper, leather sole and foam cushioned footbed. Other features include a sturdy toe box and a lightly padded collar and Achilles notch for added comfort. TeleTone Rayow tap allows you to tune your tap with an easy turn of the screw. ONE Screw Heel Tap? Bad Idea. First of all, let me say, the bulk of this shoe has held up way better than any other tap shoe my son has worn. The leather is still in great shape after six months of use, and he finds them comfortable. However, ONE screw holding the taps on is such a bad idea. My son started carrying a screwdriver with him, and screwing the taps became part of getting ready to tap. That would be okay for a comfy shoe, however, this past weekend the screw on one of his shoed snapped in half WHILE he was dancing or walking to and from the stage and he's completely lost the tap. And of course, this style of tap is not available from Capezio as a replacement part. Further, the screw snapped off so I'm not sure how we'd replace it anyway. SO disapppointed with this shoe. These tap shoes made great sound, but I'd always have to bring a screwdriver to dance class due to the loose taps. They easily fall off. Recently I had a dance recital, and both of my taps fell off onstage. I would recommend buying Bloch tap shoes. Bought these for my daughter. Every class, she has to tighten the screw on the top tap, sometimes several times! After only using these for about 4 months, the entire tap has come off the shoe! I will be contacting Capezio to see if they can be of assistance replacing the shoes. My daughter has used these twice and both times half way through the class the heel tap fell off. Wish I would have read through all the bad reviews before spending so much money. Yes they are comfortable but going to have to buy a different pair of tap shoes in order for my daughter to make it through a class without the tap falling off. I got these shoes quite some time ago. I LOVE them!!! They are comfortable and loud so you don't have to stomp your foot sooooo hard. I was very surprised when I tried on the taps. I had never worn shoes that were so comfortable. They are absolutely perfect for all levels. They look great and are easy to polish. The only problem I have found is that sometimes the screws on the taps back out--not all the way but far enough to make the taps rattle. It's easy to fix. When they do start to get loose (which is not very often) you can just screw them back in and they stay for a long time. they run a little small so order them about a half size bigger than street size. All in all these are very good shoes. My daughter loves these tap shoes ... the sound is great and they are comfortable. The problem is that the heal screws strip and cannot be replaced. This is my second pair of these shoes. The same thing happened on both pairs. Discount Dance was great with the first pair ... they replaced them. I have had this pair for about a year and half and doubt that they will replace again. I will have to find another type of shoe that give my tapper the same comfort and sound. Can not recommend this product. Dear Discount Dance, I recently placed my first order with you as a Christmas present for my husband. He has always wanted to learn how to tap dance and after my own research and help from your representatives, I was able to make an educated purchase. The tap shoes we ordered seemed to be of very good quality and they fit well (with the recommended sizing by your company). I was most impressed by your customer service. Every person I spoke with was very helpful and knowledgeable. Before I placed the order I used your website to make sure the items were in stock. However, after the order was placed I received notification that my husband's shoes were on back order. I was discouraged because I wanted his shoes for Christmas. I called customer support and spoke with Christina. She was wonderful and went above and beyond to check for a pair in his size from your CA location. She made all the arrangements to get them to us in time for Christmas. I was very pleased! Looking forward to learning how to tap in our new shoes! While these taps had a great sound to them, they are not durable. Since they only have one screw, the taps are prone to falling off. After taping in them for only 2 weeks one of the heel taps fell off, the lining came out, and the rubber on one of the soles started peeling off. They are NOT worth the price. These are the BEST tap shoes!! They are not as good as the original CG09's, which I used up until I had holes on the sides from going up on releve so much, but come pretty close! I have tapped for 4 straight years (Monday - Saturday [and sometimes Sunday]) on them and they are still working great. The only problem that has happened is one of the strings broke last year, which is expected since they are used so much!! Love these taps for the price. Their the only cheap pair that have lasted me longer than 2 months. I use to buy Miller Ben tap shoes but their so expensive that I just can't do it anymore. Anywho, I always have a problem with tap screws, same deal with these. Wore them for 2 weeks and the heel screws came loose (one heel went flying across the room) and one toe tap started this weird popping thing. I was so upset I took my broken shoes home and thankfully I have a mechanic fiance' he looked at the screws and there was no lock tight on the screw at all! he repainted the lock tight on and after that I havent had a single problem with them even the popping thing went away. LOVE THESE TAPS! This is a full sole shoe with a cushioned footbed so it will offer a bit more support than a split sole shoe would, but I would still recommend using an insert in your shoes to aid in comfort and support. I was just wondering if these tap shoes had a split sole on them. This shoe is a full sole tap shoe. If you would like assistance finding a split sole tap shoe, please contact Customer Service. Where can I find just the taps for these shoes? My toe tap has a crack. We do offer Capezio Teletone taps. In order to fit your shoes with the correct tap sizes, please contact our customer service department at 1-800-328-7107 so that we can further assist you.